Windex Bottles, 1971-72. Oil on linen, 49 3/4 x 29 3/4 in. Box of Grapes, 1969. Oil on linen, 18 1/4 x 20 in. Untitled (Two Packages of Pears), 1969. Oil on canvas, 52 1/4 x 42 in. Stuffed Peppers, 1970. Oil on canvas, 59 x 57 in. Five Tall Glasses, One Dawn Morning, 1975. Oil on linen, 36 1/4 x 40 1/8 in. Afternoon Reflections, June and September, 1978. Oil on linen, 60 x 48 in. Box of Peaches, 1972. Pastel on paper, 20 x 26 in. Daisies, 1973. Pastel on paper, 22 1/4 x 15 3/4 in. The reason for painting glass was to totally focus on light, and the glass held the light. 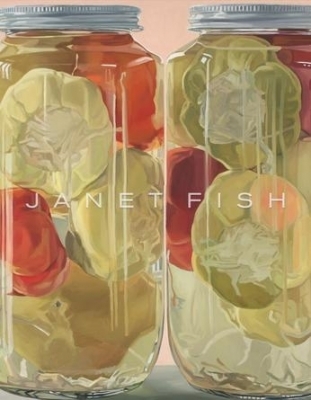 DC Moore Gallery is pleased to present Janet Fish: Glass & Plastic, The Early Years, 1968-1978. Drawn primarily from private collections, this major exhibition of Fish’s early work underscores her foundational engagement with just two materials: glass and plastic. The catalogue accompanying the exhibition features excerpts from Fish’s 1988 oral history interview for the Archives of American Art. The previously unpublished text illuminates her aims and concerns as a young painter. After graduating from Yale University with an MFA in 1963, Fish moved to New York City, where her painting progressed in dialogue with that of her Pop Art, Minimalist, and “New Realist” contemporaries while remaining resolutely fixed on her immediate surroundings. In the late 1960s, she painted a series of fruit tightly packaged in shiny cellophane. In works like Majorska Vodka (1971) and Three Honey Jars (1975), Fish created patterns of light and color out of the contents and lettered labels of oversized bottles and jars. She then began focusing on increasingly complex permutations of overlapping glassware. The work of the mid 1970s, such as Afternoon Reflections, June and September (1978), incorporates references to specific seasons and settings, pointing toward Fish’s later landscapes and vibrant still lifes. Born in Boston in 1938, Janet Fish grew up in Bermuda and now lives in New York and Vermont. Her paintings are included in the collections of the Art Institute of Chicago; Dallas Museum of Art; Detroit Institute of Arts; Metropolitan Museum of Art; Museum of Fine Arts, Boston; Museum of Fine Arts, Houston; and Whitney Museum of American Art, among many others. The New Yorker: Review of "Glass and Plastic: The Early Years, 1968 - 1978"
The New Yorker: "Janet Fish: Glass & Plastic"
Hyperallergic.com: "Janet Fish’s Jarring Experiments in Still Life Painting"